We specialise in Vendor Equipment Finance. Established by Steve Sykes in 1993, and with offices in Sydney, Melbourne, Brisbane and the Gold Coast, and soon to be Australia wide. 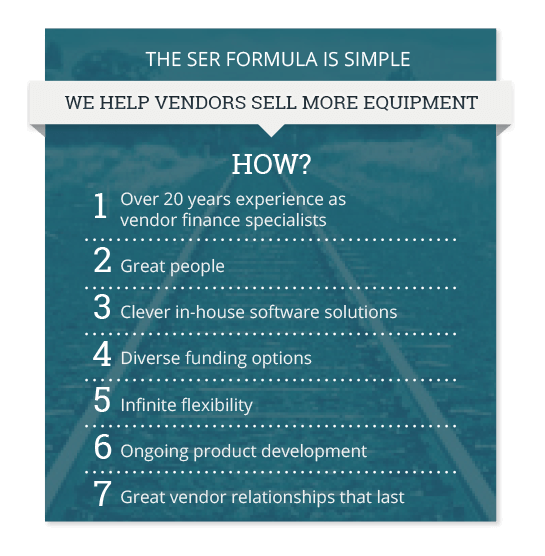 Our management team of five has almost 100 years of vendor finance experience with nearly 70 years of experience at SER. Read more about Our People. We understand how fast things are changing and the challenges you face. As experts in Managed Print or Facilities Management Plans we can help you develop a usage based as a service offer to your end user on a wide range of equipment. Small enough to be nimble, yet big enough to attract funding from around the world, you will find we can meet any challenge. Our mantra dictates that we must continually improve. This has manifested itself into the creation of our new software platform called Finance Oxygen. We say it is a Game Changer because it reflects everything we know about you, our vendor, and has sought to simplify, speed up and mistake proof the finance experience for your sales people and management. Yet, the secret sauce isn’t the platform. Finance Oxygen does the process work for you and for us, leaving our people to look after you, and your customers! The result is a spectacular combination of great speed, great accuracy and great service. All of this simply means that using Finance Oxygen, you the vendor, are far more likely to get paid quicker. At SER we listen to what you are trying to do, then help you get there.